TransportiCA: Green Caltrain: BART station access plan: should Peninsula BART stations stay car-centric? 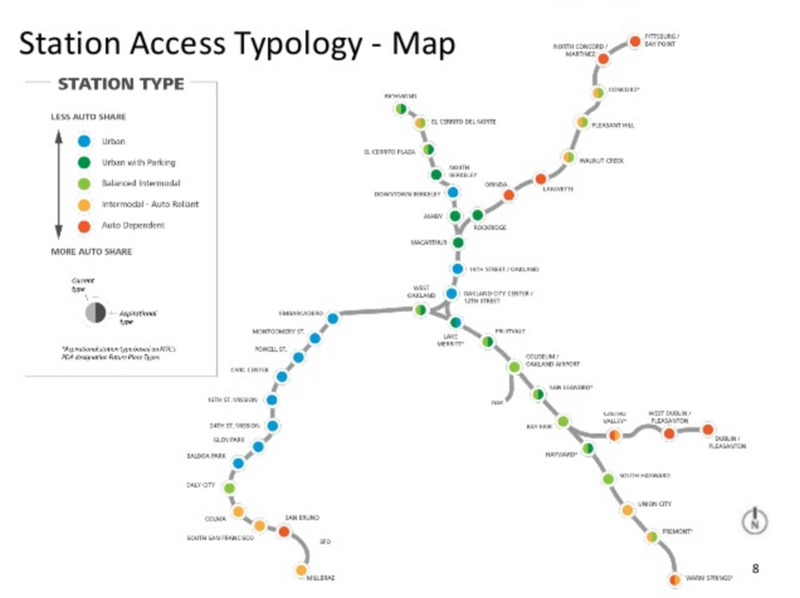 Green Caltrain: BART station access plan: should Peninsula BART stations stay car-centric? Last week, the BART board reviewed a draft station access plan, proposing a more active role in improving access to BART stations. The types of improvements are defined based on the categories of stations, with some stations slated for improved sustainable access. The Peninsula stations in San Bruno, South San Francisco, and Millbrae, are proposed to be categorized as car-centric, now and into the foreseeable future – despite current and planned transit-oriented development in the station areas. The plan proposes focusing on five stations to improve, which is a helpful strategy to concentrate resources to deliver results in key areas, but will leave many other station areas and cities in the cold. Based on recent the experience working in the small city of Millbrae, local council members have limited experience of transportation trends and changing effective practices, and city staff has limited capacity. BART has an opportunity to play a powerful and helpful role, by creating a toolkit that could be used by cities with stations beyond the top 5. BART could bring valuable perspectives across the broad region, capacity to keep up with effective practices, and the value of providing basic information about issues such as pedestrian, bicycle, and bus/shuttle access, the appropriate role of parking in transit-oriented developments, and other core topics. While cities would not welcome a transit agency seeking to establishing mandates on issues that are governed locally, cities would greatly benefit from and welcome guidelines regarding effective practices that are outside their experience base. This strategy could also include opportunities for willing cities to partner actively with BART to improve station access, including pursuit of other sources of regional funding to plan and implement. Regarding goals and metrics, the draft plan suggests a reducing collisions involving pedestrians and bicycles within ¼ mile radius of stations. However, the bicycle catchment area for a station is much larger than ¼ mile, with passengers traveling 1-2 miles to reach their station. Anecdotally, for example, people bicycle from Burlingame 1-2 miles to the Millbrae station. It would be of value to partner with cities and counties on plans to improve bike routes to the station in the bicycle catchment area. The draft plan is light on parking policies. It would make sense to consider the relationship between station parking, the price of parking, transit-oriented development, the potential for shared parking, and transportation demand management for development in station areas. It makes sense to use pricing to ensure available supply for those who need, to incent more sustainable and space-efficient modes, and to adapt to less car-centric patterns over time with more infill development near transit. What do you think? Do you use BART on the Peninsula? Would you want to see evolution toward better walking, bicycling, and transit access at Peninsula stations. Does it make sense for BART to provide more robust guidelines for small cities such as Millbrae to improve station access? Should BART seek to evolve parking policies to improve incentives for sustainable access?